G. K. Chesterton was a journalist and prolific author of poems, novels, short stories, travel books and social criticism. Prior to the twentieth century, Chesterton expressed sympathy for Jews and hostility towards antisemitism. He was agitated by Russian pogroms and felt sympathy for Captain Dreyfus. However, early into the twentieth century, he developed an irrational fear about the presence of Jews in Christian society. He started to argue that it was the Jews who oppressed the Russians rather than the Russians who oppressed the Jews, and he suggested that Alfred Dreyfus was not as innocent as the English newspapers claimed (click link for more on Chesterton and the Dreyfus Affair). His caricatures of Jews were often that of grotesque creatures dressed up as English people. His fictional and his non-fictional works repeated antisemitic stereotypes of Jewish greed and usury, bolshevism, cowardice, disloyalty and secrecy. 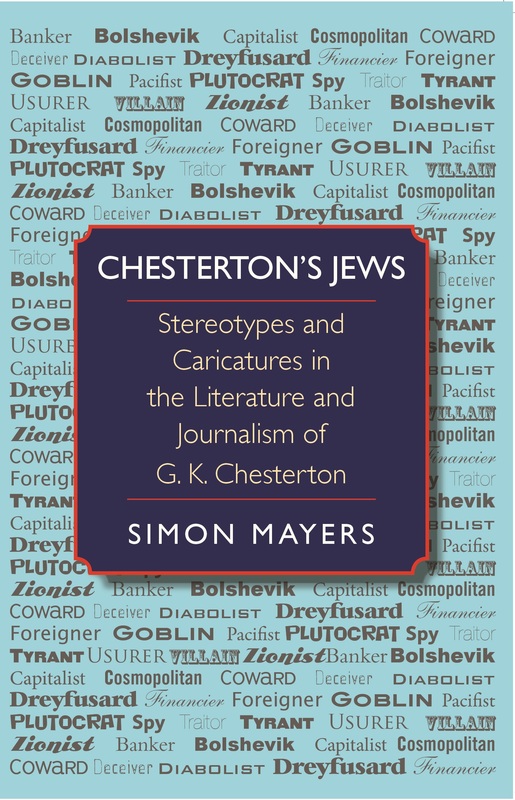 Many of Chesterton’s admirers fervently deny the presence of anti-Jewish hostility in his writings. Some of his defenders believe that Chesterton was an important figure within the Church, perhaps even a prophet or a saint. In fact, a growing number of people would like to see Chesterton canonised as a saint, and no doubt some are concerned that the accusation of antisemitism might prove an obstacle to such efforts. Since the publication of Chesterton’s Jews, the Bishop of Northampton, Peter Doyle, has appointed Canon John Udris to conduct an initial fact-finding investigation into the possibility of starting a cause for the canonisation of Chesterton. According to a report in the Catholic Herald on 3 March 2014, one of the reasons that the bishop selected Canon Udris for this investigation was that he has a “personal devotion to Chesterton,” and could thus be expected to put some “energy” into it. According to the report, referring to Chesterton’s argument that the Jews should be made to wear distinctive clothing so that everyone will know that they are “outsiders” (i.e. foreigners), Canon Udris observed that “you can understand why people make the assumption that he is anti-Semitic. But I would want to make the opposite case.” (Link for more on this canonisation investigation). By Simon in Antisemitism, G. K. Chesterton on March 30, 2014 . I don’t think anti-Semitism necessarily follows from ‘distinctive dress’ since Chesterton himself carried a swordcane and wore a cape it could be argued that he wanted everyone to dress distinctly. It could also be argued that, since the Jewish people generally consider themselves in diaspora, he was just in accord with Orthodox Jews in encouraging an expression of that identity. But it is an issue worthy of attention. Chesterton freely decided, as an individual, to wear a cape and carry a sword cane. He thus, as an individual, made a personal aesthetic decision. Conversely, when it came to the Jews, Chesterton wanted to remove this right for an individual to make his or her own personal decision about his or her appearance. He argued that any and all Jews, by the legal enactment of “one single-clause bill; one simple and sweeping law about Jews,” should be required by law to wear distinctive dress (i.e. oriental robes). His point, in his own words, was as follows: “If my image is quaint my intention is quite serious; and the point of it is not personal to any particular Jew. The point applies to any Jew, and to our own recovery of healthier relations with him. The point is that we should know where we are; and he would know where he is, which is in a foreign land” (quote from G. K. Chesterton, The New Jerusalem, London: Thomas Nelson, 1920, p.227). In short, he wanted Jews to be obligated to wear distinctive clothing as a mark of “foreignness”. If one or more Jews, as individuals, or as a community group (as in the case of some Orthodox Jews), decide that they want to wear distinctive clothing (of their design rather than Chesterton’s suggestion of oriental robes), then they should be allowed – as indeed they are allowed – to do so. However, many European Jews do not choose to wear distinctive clothing, and do not consider themselves to be in “a foreign land” – and it hopefully goes without saying, should not by a “simple and sweeping law” be forced and coerced to wear distinctive dress not of their choosing. As a second point, Chesterton’s suggestion that Jews should be forced to wear distinctive clothing was not the only deprecating suggestion he made. As I have discussed elsewhere on this web site (and in my book), both his fictional and his non-fictional works frequently repeated stereotypes of Jewish greed and usury, bolshevism, cowardice, disloyalty and secrecy.